Now here we go for I am posting some more recipes. I am sorry that I am unable to post much visuals. Any way all the Curd Chutneys look the same when photographed. Here we are using raw onions. For this, it is better to use Onion which is white (the outer skin) in colour instead of the pink ones. The white one is less pungent and keeps the body cool. White onion is preferred in salads. 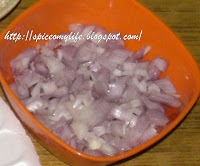 Peel and chop onions into very small pieces. Heat oil in a small pan until its smoking, lower the heat to minimum. Add chick pea, fry for two minutes. Add black gram, after a minute or two, add mustard seeds. When it starts spluttering, add cumin, dried chilly, green chilly, asafoetida, turmeric and curry leaves. Mix and after a minute remove from fire and keep aside. You can use green chilly with out frying. Let it cool completely. In a bowl take the curd, salt, sugar, tempering, mix well,. Add chopped Onion and mix it lightly, garnish with coriander and serve. It is better to let this chutney to stand for some time say half an hour, so that the raw onion absorbs all the flavours. Peel and chop onions into very small pieces. Heat 1-2 tsp of oil in a pan and fry onions till they turn slightly pink in colour. Add a pinch of sugar while frying, it makes the onion translucent and shiny. In a bowl take the curd, salt, sugar, tempering, mix well,. Add the Onion and mix it lightly, garnish with coriander and serve. Peel and chop onions into very small pieces. Similarly, wash the tomato and shop into fine pieces. In a bowl take the curd, salt, sugar, tempering, mix well,. Add chopped Onion and tomato and mix it lightly, garnish with coriander and serve. In a bowl take the curd, salt, sugar, tempering, mix well,. 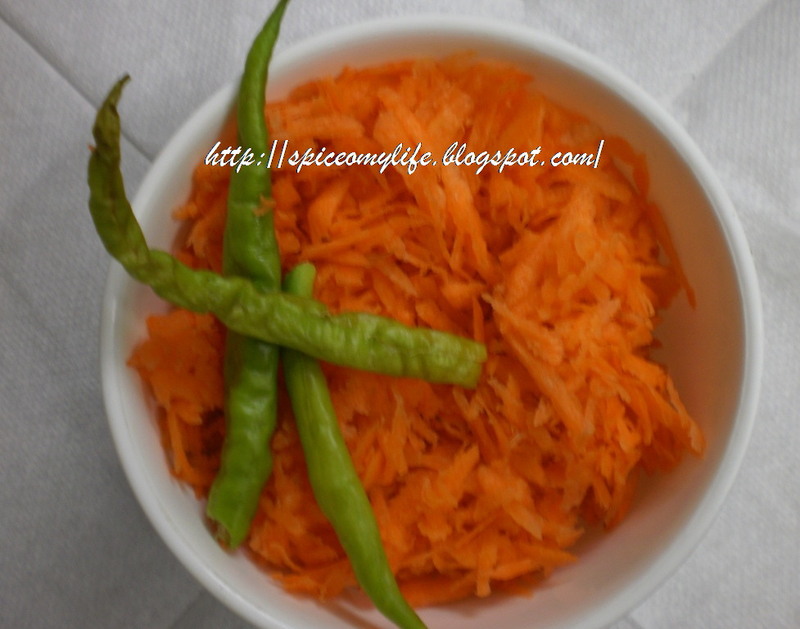 Add grated Carrots and mix it lightly, garnish with coriander and serve. Some don't like raw carrots. If that's the case. Heat 1-2 tsp oil in a non stick pan. Lightly fry the grated Carrots till they loose the raw taste and then use it. The rest of the procedure is the same. 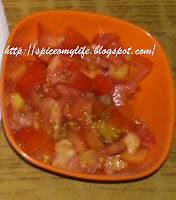 Here we are using raw tomatoes.Tomatoes can be of salad variety or locally available juicy one. The salad variety are firm. The other variety is slightly sour and hence tastier. Clean them and chop them finely. In a bowl take the curd, salt, sugar, tempering, mix well. 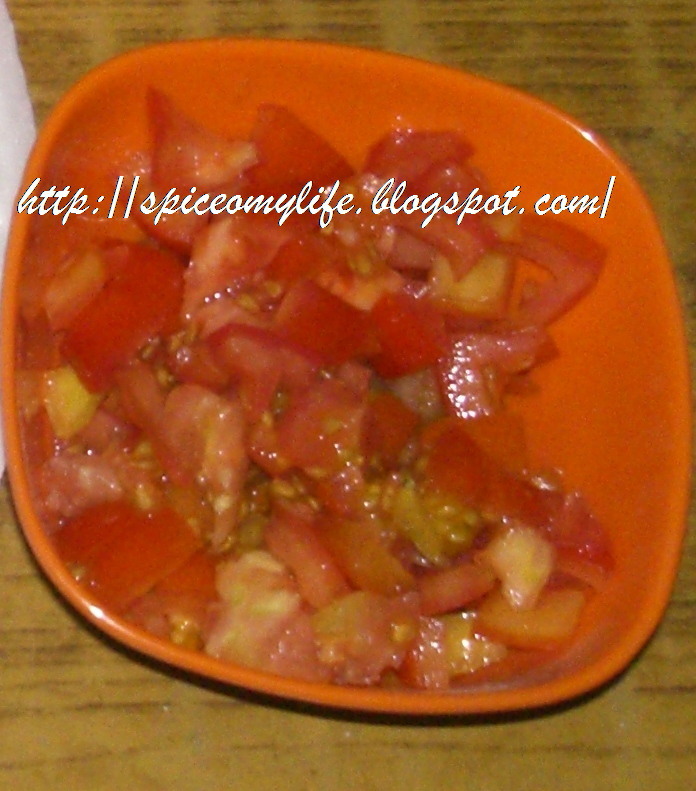 Add chopped tomatoes on and mix it lightly, garnish with coriander and serve.